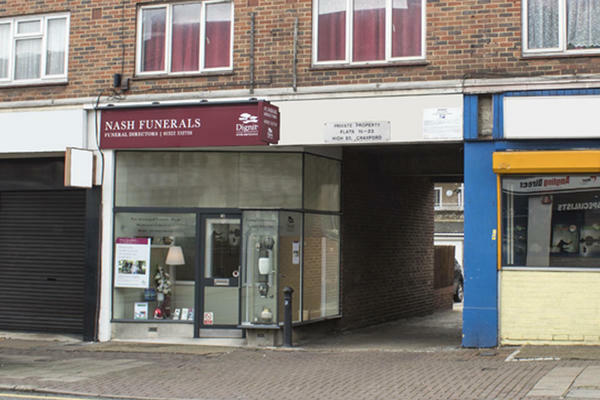 At Nash Funeral Directors in Crayford, we have been serving our community with kindness and professionalism since 1891. Our funeral home is easily found on the High Street, where our helpful team will welcome you when you visit. We are here to arrange a funeral service that pays tribute to your loved one’s life, bringing friends and family together to pay their respects. We can help you make arrangements for services of all faiths and cultures, tailoring every detail to be unique and personal. We work closely with the beautiful St. Paulinus church in Crayford. Many of our local families choose to have their loved ones' funerals there, and we are honoured to help run regular memorials. With a funeral home in Welling too, our compassionate funeral directors are at the heart of the London Borough of Bexley. Please give us a call on 01322 552738 as soon as you need our advice. Our lines are always open. You can park for free at Sainsbury's at the end of the Crayford High Street, a short walk away. You can find us close to the Tower Retail Park. Our staff are available 24 hours a day on 01322 552738 if you require our services outside of these hours.